Easily set the ambiance of any room and control your lights from anywhere with Wemo Dimmer. 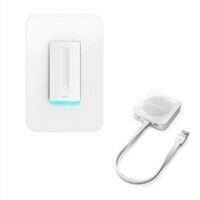 This smart dimmer connects to your existing home Wi-Fi network to provide wireless control of your lights with no subscription or hub required. From bedroom lights and dining room chandeliers to recessed lighting, Wemo Dimmer can control nearly anything that a traditional dimmer switch can. Whether you're unwinding on the couch, meeting in the boardroom, or vacationing in Barbados, you'll be able to remotely control and dim your home lighting from anywhere.